Is it time to buy a new pillow? Do you have a good night sleep? Do you wake up feeling rested? Do you wake up with a tight or sore neck? Do you wake up with Pin’s & Needles in your hands? Do you wake up with headaches? Then it maybe time to look for a new pillow, and below we show you a few tips in how to choose a pillow. Choosing the correct pillow for you individually is a very important decision to make. Most people try the hit and miss technique. They buy and try as many pillows as they can till they find the pillow that they are comfortable with. This technique for choosing a pillow is very expensive and can cause added stress and tension to your neck and upper back. Incorrect spinal posture is a major cause of back and neck problems. A third of your life is spent sleeping, so correct sleeping posture is a must. If your pillow is the wrong height, both muscles and joints will be affected. In some cases, incorrect head and neck positioning can even effect breathing and be the cause of snoring. Not only do you need to get enough sleep, you need to get enough good quality sleep. Having an incorrect sleeping posture can prevent you from having a good night sleep and lead you to continually wake up and not feel rested. In addition, common complaints resulting from either an incorrect pillow or sleeping position include neck stiffness and headaches. A pillow should be designed to support your head and neck in a neutral position aligned with the rest of your spine. The necessary height of your pillow will vary depending on the position you sleep in, which depending on your spinal health, should either be your side or your back. Your pillow should provide lasting support to your head andneck, without continually needing to adjust your sleeping position to get comfortable. There should be no space between your neck and pillow. Get the right head and neck support – Who would ever want to sleep awkwardly? Become aware of the position you sleep in – That way you know what sort of height you want your pillow. Consider a pillow that is hypo-allergenic – You can be surprised by how much can accumulate in your pillow over time. This includes, skin cells, dust mites, fungus and mould. 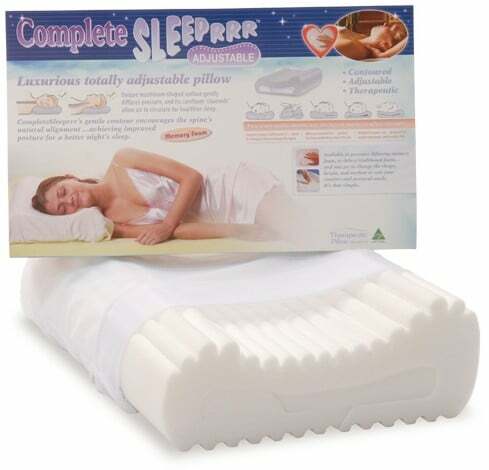 Memory foam pillows are a great choice as they are hypoallergenic and usually recommended for sufferers of asthma and allergies. Choose a pillow that is appropriate for your body size – if you are of a smaller frame you will not need as firm of a pillow compared to larger frames or people with broader shoulders. Consider a pillow that is size adjustable – This is a great way to choose what pillow height is the most comfortable for you. Keep track of how old your pillow is. Pillows should be replaced every 18 months to make sure you are getting the proper neck support. Buy a pillow that is good quality and will last. At Back to Basics Chiropractic we use and recommend memory foam pillows and have found the Complete Sleeprrr pillows to be the most supportive pillows currently available.